Pack more with these techniques! Because every last inch of suitcase real estate counts, and you don't want to wrinkle your sweaters, break a precious bottle of Chanel No. 5, or worst case scenario: lose your bag at the airport. It's time to streamline/safeguard your approach. 1. Roll, don't fold clothes. It's faster and will maximize your space! Reserve the classic layer cake fold for more delicate or wrinkle-prone fabrics.? Save space while helping your bras maintain their shape by stacking them on top of each other. You can even store you underwear inside the cups. 3. Cover your footwear with shoe bags or shower caps. 4. Pack two tops for every bottom. You're more likely to re-wear a pair of bottoms than a top. 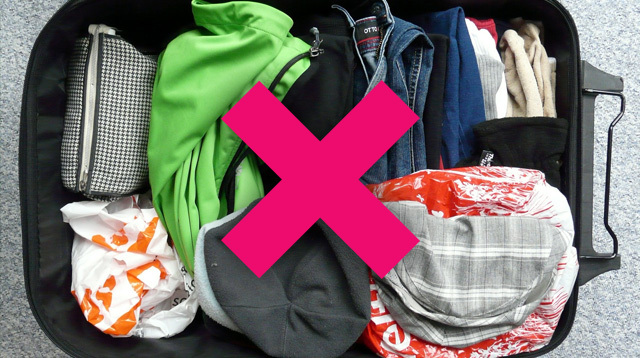 So to avoid overpacking, stick to this rule: Pack two different tops (perhaps a blouse and a sweater) for every bottom. As far as bottoms go, Bromstad believes you should always have light and dark wash denim options. 5. Pack your clothes inside out. 6. Pack the heaviest items closest to the wheels. 7. Put your toiletries in a transparent bag. Keep your toiletries and makeup in a see-through pouch. It will not only keep things confined in case of a leak, but you'll be able to see everything in one place, without digging through your suitcase. 8. Put loose wires in a sunglasses case. To avoid messy tangles with your various wires, roll them up tightly and put them in a sunglasses case, which is easy to open/close and won't allow them to move around on the go. You can also do the same with jewelry. 9. Put breakables in socks?. When it comes to breakables, like a glass perfume bottle, take extra precaution by slipping it into a sock. This will also prevent it from scratching. 10. Capitalize on empty space. Every nook and cranny counts! So look for underutilized space, like the insides of shoes (if they're clean! ), for small essentials like headphones or change purses. 11. Pack an empty tote for laundry.